There’s a big island called Margaret Island, or Margitsziget, in the Danube at the northern side of Budapest. Once of its features is an amazing fountain, which is accompanied by recorded music several times an hour. 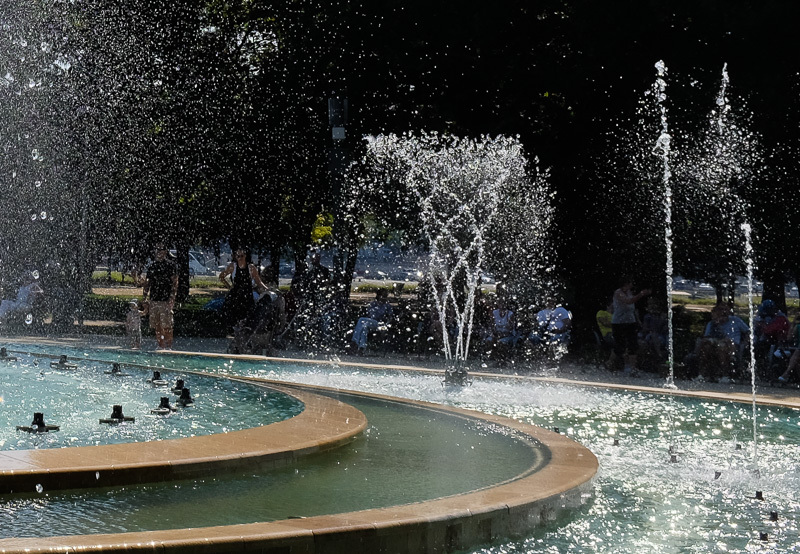 Hungarians are very clever people, and the fountain design is fairly awesome. I thought of 3-D mathematical Lissajous curves. For most of this vacation I wore a new pair of Mephisto Shark sandals, very comfortable. 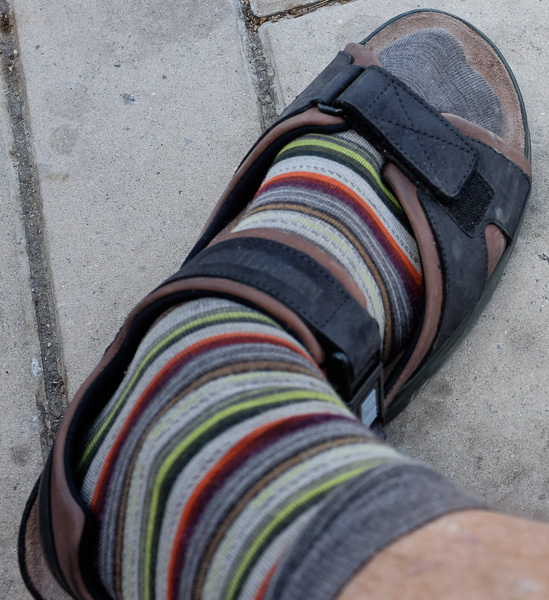 As has been my fashion-insensitive custom for going on forty years, I often wore my sandals with patterned socks. Mais oui! The busses, trains, and trams work really well in Budapest, as in the rest of Europe. One of those things that America should have mastered by now, but for some reason hasn’t. Like making good bread and good butter and serving good meat in restaurants. We saw some interesting people on the trams, like this woman (on the right) with her son, who was busy trying to burst a make-shift balloon made of an inflated latex glove. The tough-looking woman was on her cell phone the whole time, talking Hungarian of course. Yet another shot from Corvin Ter. 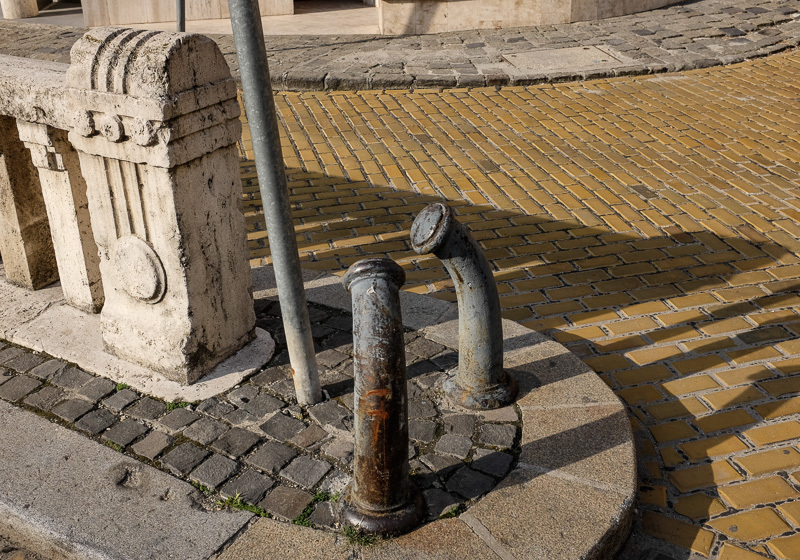 Love these bent bollards. Georgia, Courney, and kids took us around in Pest one day, in a funkier, more night-life-loving neighborhood. 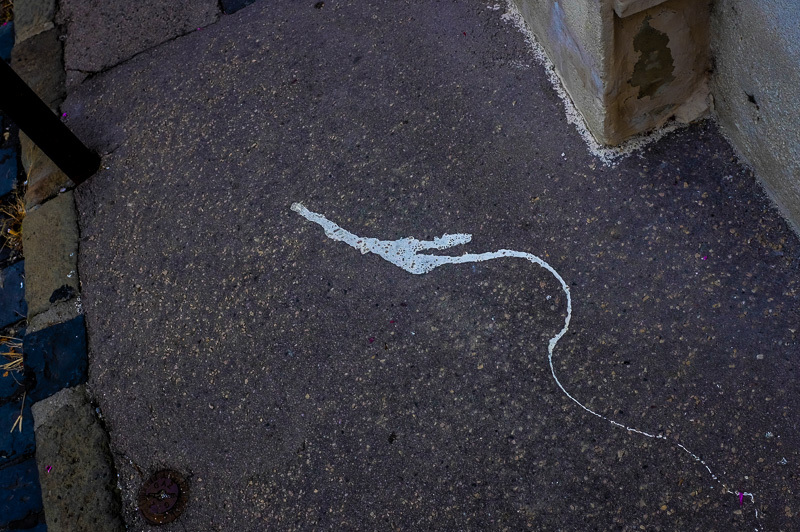 I liked this drip of white paint on the dark sidewalk. A mystery arrow. 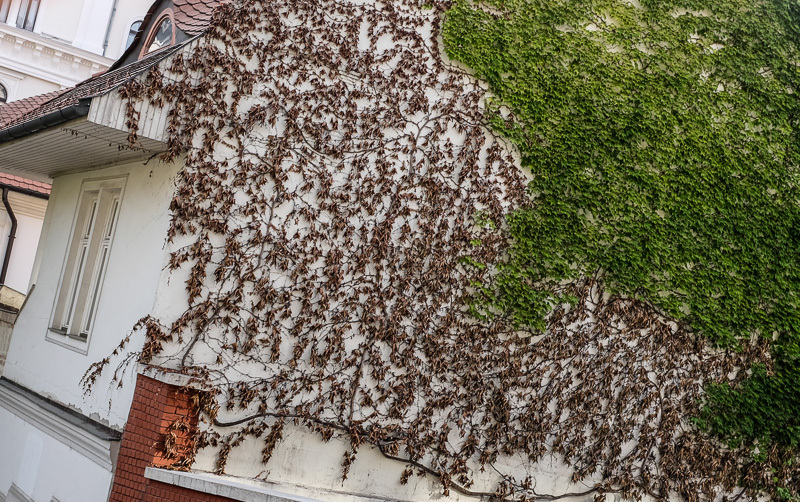 The dead and live vines on this wall caught my eye. Spreading fractal zones of influence. I usuall do my best to crop out images of automobiles from my photos. Somehow cars are almost always mundane and boring. 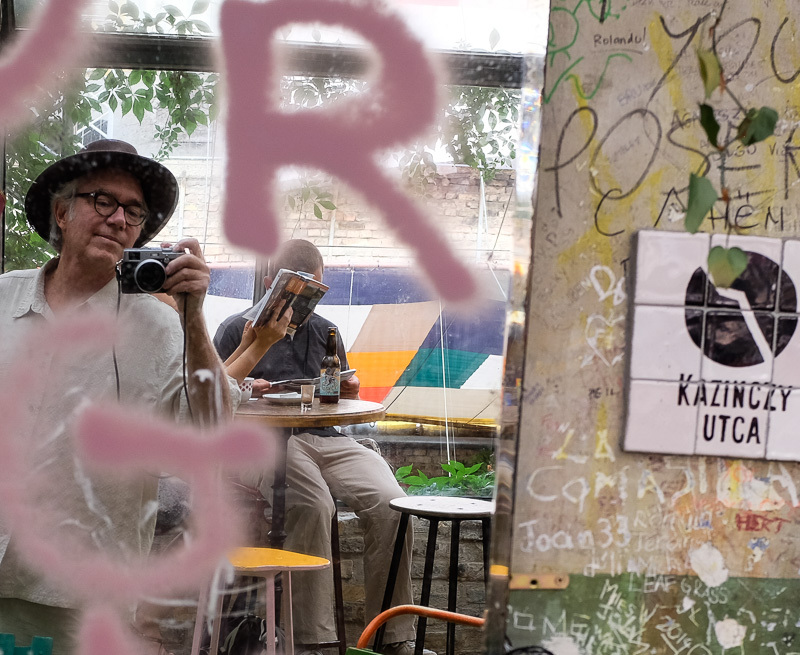 We made our way to one of our children’s favorite places in Budapest, the Szimpla Farmers Cafe, which could also be termed a “ruin bar,” that is, a multi-room hangout/nightclub carved out of a more or less uninhabited building, including an open courtyard. 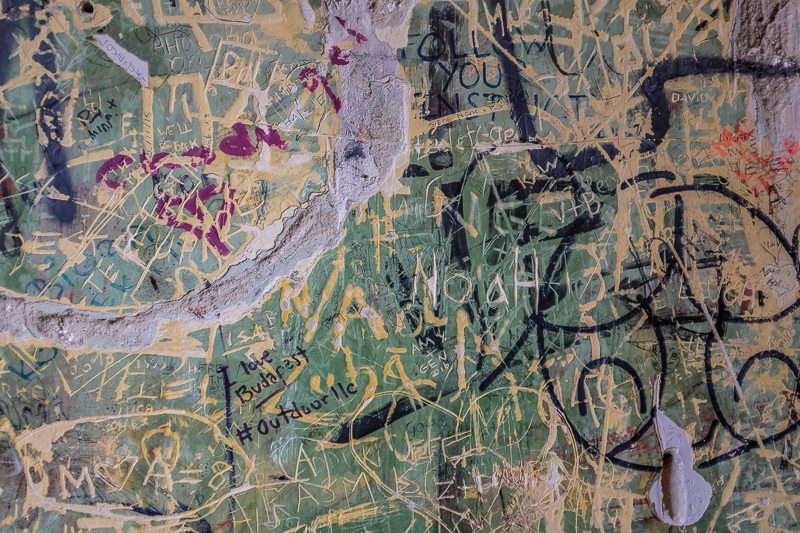 Graffiti on nearly every surface. I spotted myself in a mirror here. 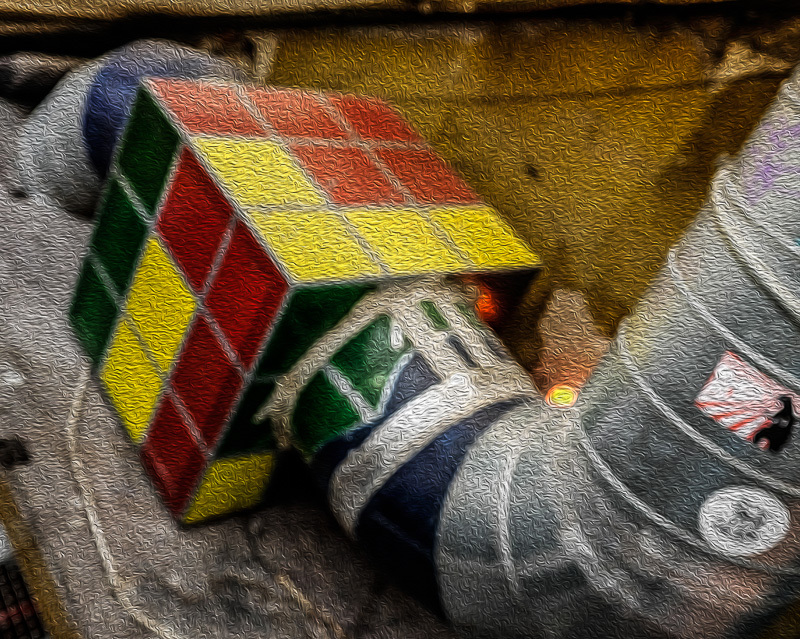 Naturaly Erno Rubik is a Hungarian folk hero for his famous Rubik’s Cube. The Szimpla ventilation system incorporates a painted sheet-metal model of the Cube. This image was out of focus, so I applied an “oil paint” filter to it, giving it a nice look. Like a graffiti image of the actual photo. 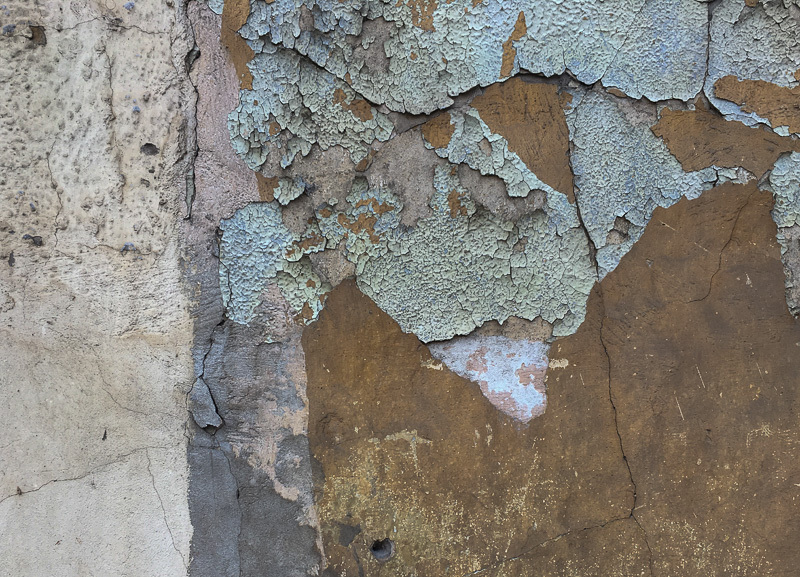 A pure image of Szimpla graffiti, including deep grooves scratched into the plaster wall. Gorgeous. Georgia and Courtney told us that, at night, young women walk the rooms of Szimpla with huge trays of giant, raw, peeled carrots for sale as snacks. SO non-American. Love it. From Szimpla we moved on to a nice cafe reatuarant in a different courtyard. 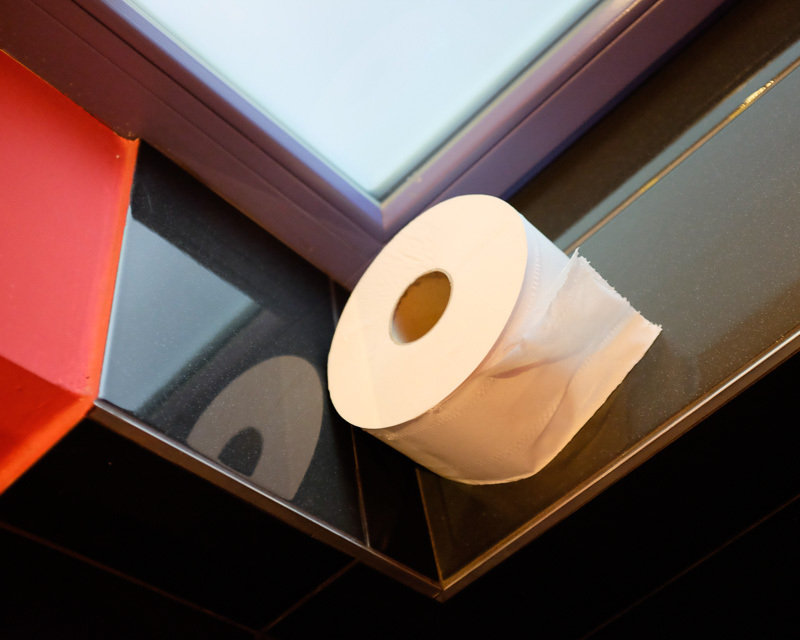 I was struck by the beauty of a waiting toilet paper roll in its immaculate Euro surroundings. 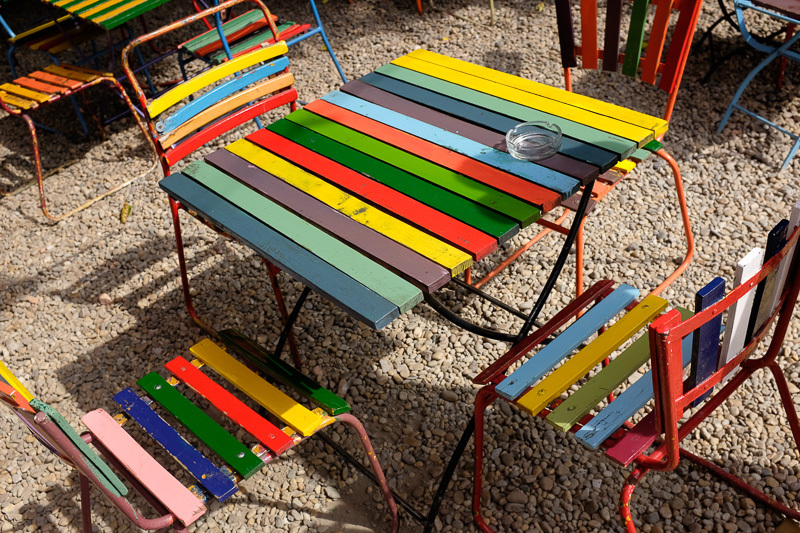 The cafe’s decor style was, basically, “random colors for the hell of it.” But the colors had approcimately the same brightness, and the merge worked well. 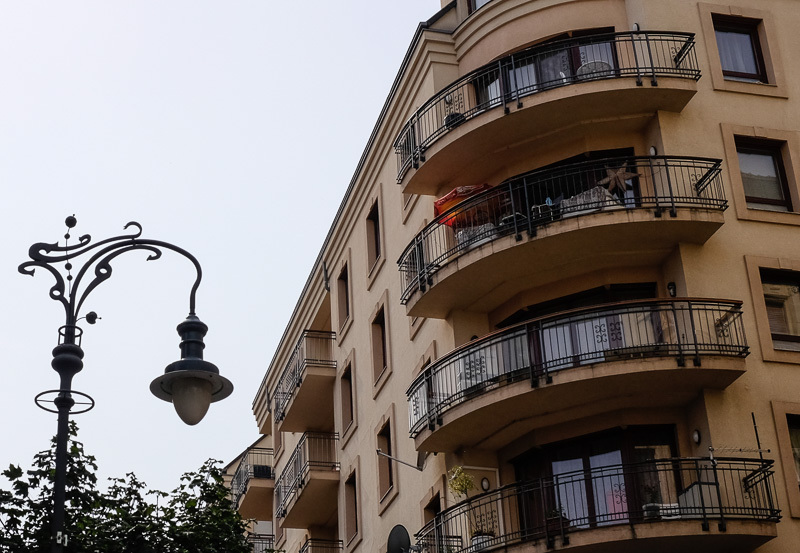 Some awesome wrought iron deco-style street lamps outside, and some deco-style apartment buildings as well. Something I always like in Manhattan is the presence of the 1920s – 1940s style skyscrapers. 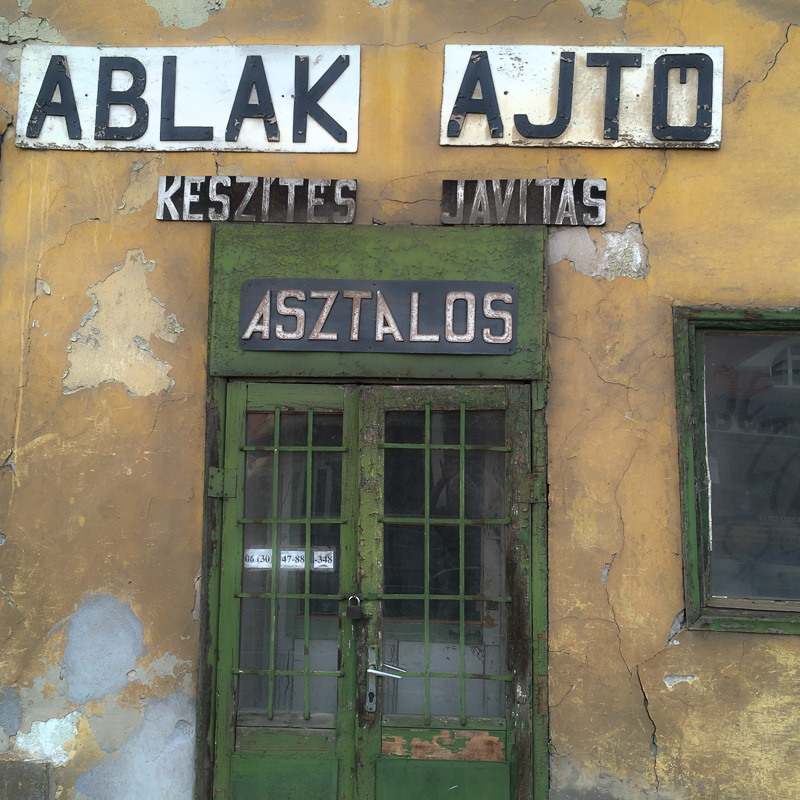 Budapest has an even broader palette of architectural sytles. A lot of the city was badly bombed in WWII, but interesting swaths survived…and a number of structures were rebuilt. 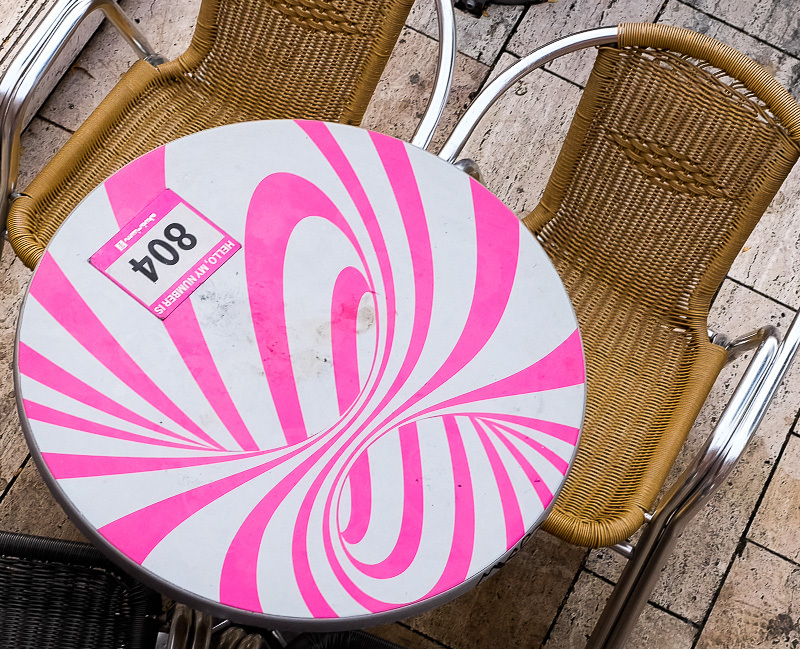 Dig this slackadelic op-art candy-cane-bridge table-top in an inner-city Budapest cafe called the Akvarium Klub. A flat reflecting pool lies above the underground club’s roof. The grandkids and I had the delight of seeing any angry security guard chase off some rowdy young women who were wading in the pool, with some danger of falling through into the Klub along with a million gallons of tepid Hammond microorganism-laden water. We kids and I got away with wading at the edge. 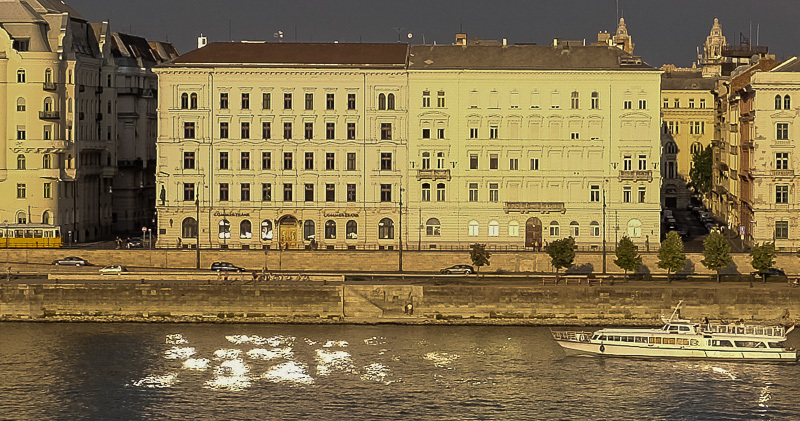 Looking out at the Danube from our Art’otel windows one afternoon Sylvia and I saw these far-out patches of light on the river. The sun was setting behind us, and the light was bouncing off a building’s windows and onto the water. Nature’s mindbogglingly intricate computations. Simple pleasures. 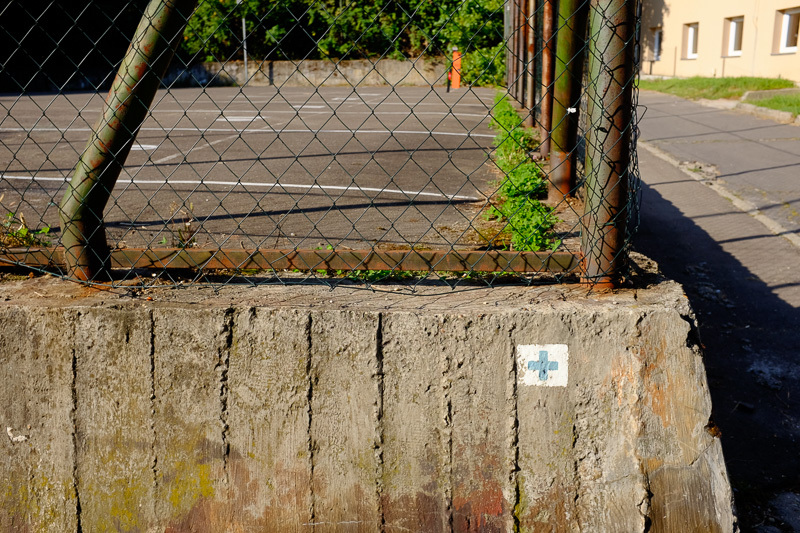 A plus sign on a worn bit of concrete with a fence atop. 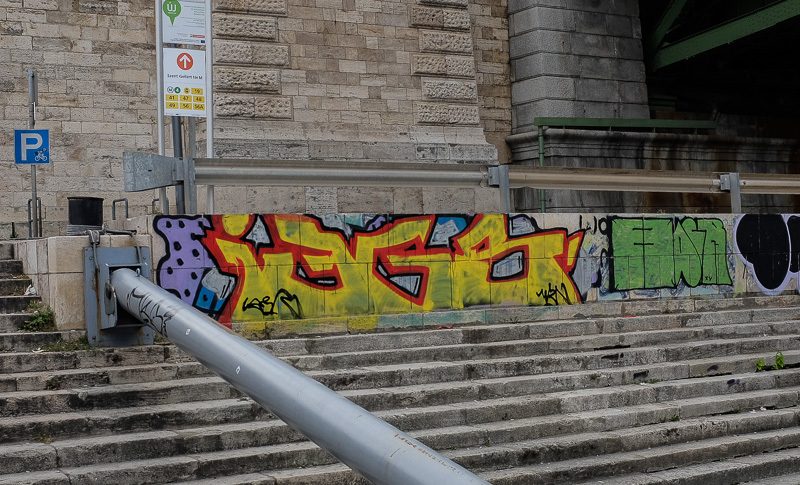 After about six days in Budapest, we went on to Vienna—and I’ll post the Vienna images in follow-up posts. Sticking to Hungary for now, after Vienna we returned to Budapest and went on to a small Hungarian country town called Eger, known for their vinyards. Some of Sylvia’s many Hungarian relatives were having a family reunion in a country inn there. 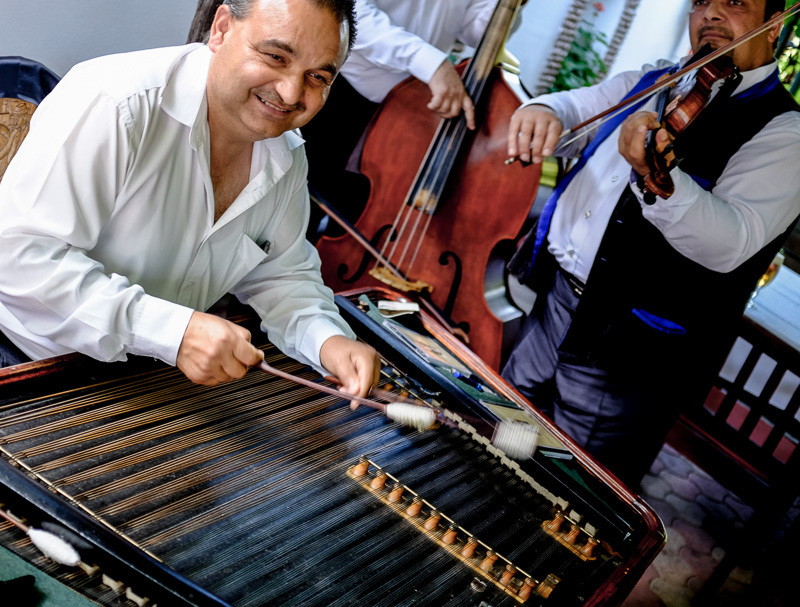 The guy in this picture is playing a cimbalom, an unfamiliar (to me) instrument that’s popular in Hungary. Kind of like a piano or dulcimer in terms of having stretched strings, but they guy was playing it by hammering the strings with some soft sticks. An Eger band. The guy playing the violin was the group’s front man, a character. Whenever I’d start to take a group picture of my family, the guy with the violin would push forward to get into the family picture, standing in the back row with the others. 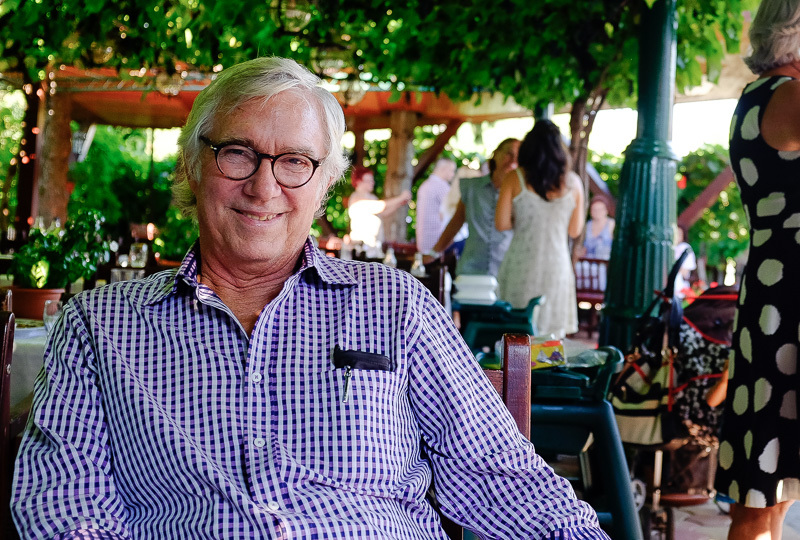 This is me at the big reunion, kicking back beneath an arbor of wine vines with dangling bunches of grapes, and after a meal featuring, among other delights, a very fine Weiner schnitzel, a.k.a. “Bechsi szelet” (Vienna slice). I’d foudn a semi-decent shirt for the event. After nearly two weeks, I’d pretty much stopped trying to categorize my meager stash of garments as “clen” or “dirty,” it was more a matter of which one I hadn’t actually worn for a few days. There’s a certain sense of a middle Eastern influence in Hungary. 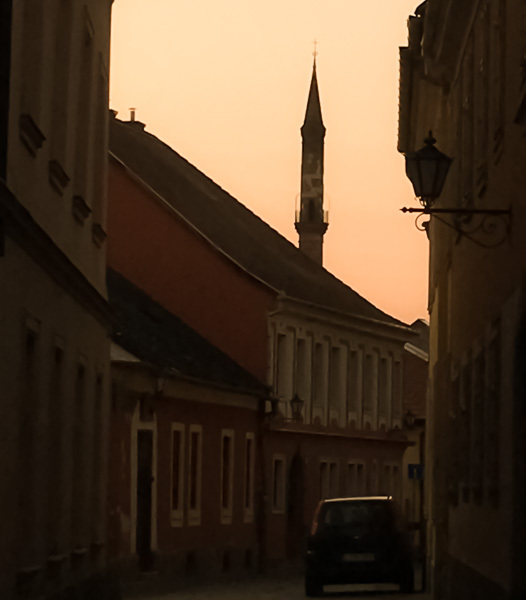 We even found a minaret in Eger, although it was smaller than it looks in this photo, we walked to it and it wasn’t all that far away. A partly crumbling tower with serious fist-sized chunks of stone at its base. No American-style warning signs though. More like—figure it out for yourself. Love this twilight view. Here again I used an iPhone 6 rather than my heavy-duty Fujiflim X100T, so the image is bit grainier than I’d like. But very myserious and enticing. 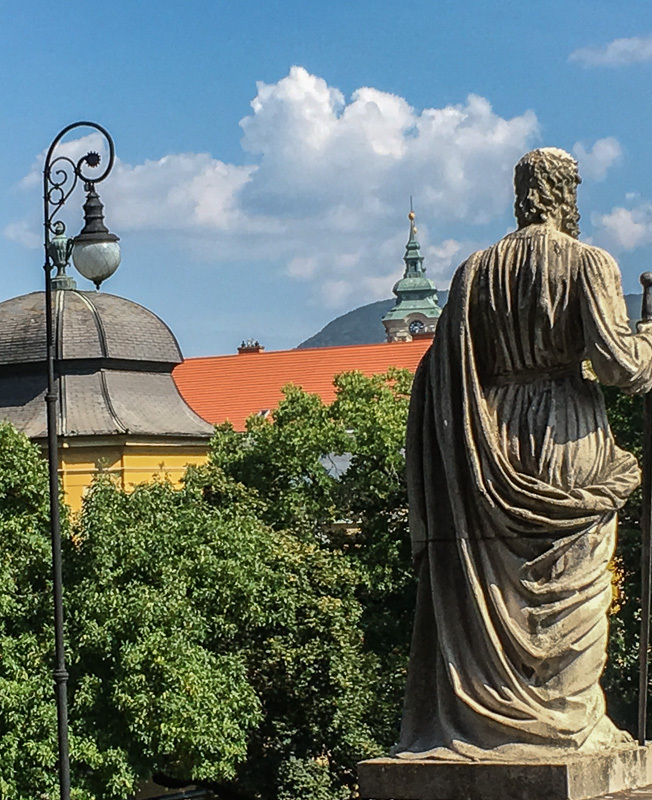 What would it be like to move to Eger? 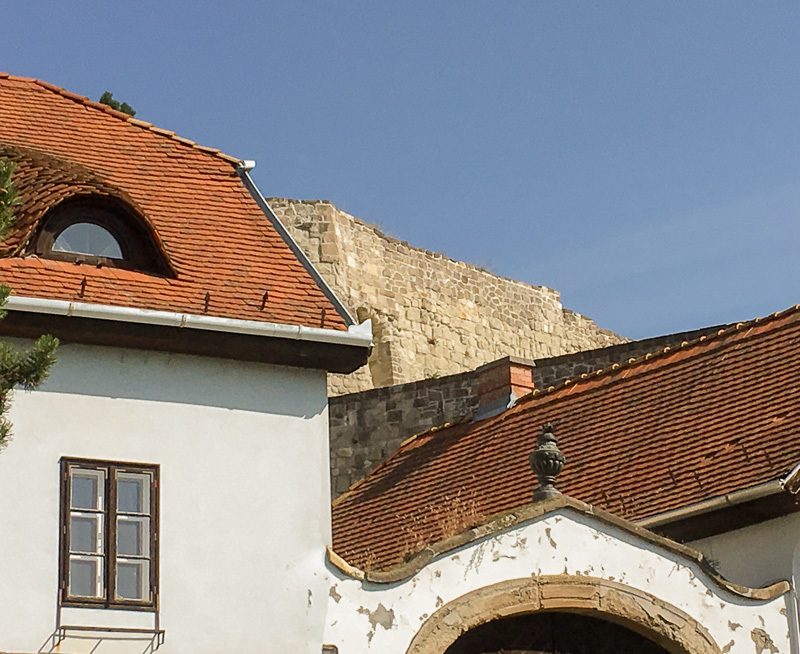 The wall of an old castle looms above Eger. Dig the patchwork of roofs and walls and sky. Love it. We hit a big cathedral or basilicum in downtown Eger. Classic Euro scene here of a marble statue against trees. You can’t see in this photo, but in the parking lot down there, some of the locals were having a car festival, celebrating some kind of really tiny car, like Fiats or Ladas or some such. As opposed to the populuxe Detroit rides you might see at a California car fair. With a magnificent peeling wall. Next installment will be on our days in Vienna. This entry was posted on Wednesday, September 14th, 2016 at 5:42 am	and is filed under Rudy's Blog. You can follow any responses to this entry through the RSS 2.0 feed. Both comments and pings are currently closed. Igen, igen!! Feast for the eyes. You captured BP well, poppers! I am always envious of your skill with a camera. I can appreciate the creativity of the photos, but just can’t ever seem to find the same degree of “coolness” in my shots. Thanks for the new views!